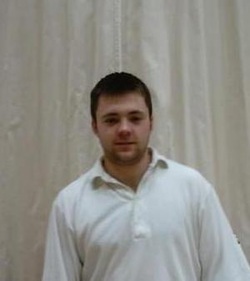 Darren started his cricketing career as a junior at Sowerby Bridge ..... before moving into senior cricket at Illingworth in the Aire Wharfe League. In his short carrer ..... he appears to have had more clubs than Ian Woosnam ...... having spells at Copley ...... King Cross ..... Heckmondwike ..... and Stainland ..... before signing for Golcar. Early cricketing honours to come Darrens way ..... have included ..... selection for the Halifax Joe Lumb side ..... including being selected in the league rep team that played against the Middlesex tourists ..... 3 years at the Yorkshire School of Excellence ..... plus a scholarship to the Scarborough Cricket School ..... then gaining full representative selection for the Halifax League senior team whilst he was at Stainland. As a proud Yorkshireman ..... Daz has named Darren Gough as his sporting hero ..... closely followed by the man who made him suffer 24 hours a day cricket from the age of 1 .... ! His outstanding achievements in the game include making a top score of 186 against Rastrick in the promotion winning season '04 ..... which just beat his previous one of 184 ..... made whilst he was at Stainland ..... and once taking all 10 victims ..... as a keeper ..... in his junior days ..... that was before deciding he was a bowler ..... ! Also a keen footballer ...... Darren plays in goal for Stainland United ..... one of Halifax's Premier League clubs ...... but unfortunately his all round sporting ability does not carry over onto the golf course ..... where he can often be spotted 'hacking' his way round the fairways of Elland and Bradley Hall ..... ! !